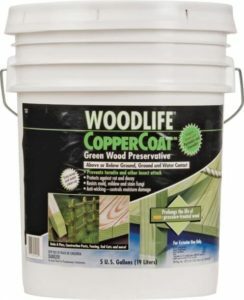 Prevents attack from termites and other wood boring insects while it protects against rot and decay. Inhibits mold, mildew and staining, and staining fungi. EPA registered, insecticidal preservative prohibits rot and decay. Anti-wicking property resists moisture absorption controls warping, swelling, and end checking. Imparts a transparent green color that naturally fades over time. Paintable and stainable. Easy soap and water clean up. Water-base formula. Covers approximately 200 to 350 sq. ft. per gallon.